#UKStorm2013 is the hashtag being used by thousands, including Downing Street, to archive the plight of Britain. Our fascination with the weather. It has been dubbed the “worst storm for years” yet in reality it feels very much like the biannual occurrence of high winds and heavy rain. British media aims to reach to so many and so you could be forgiven for thinking nothing else has happened over the past 24 hours. Some websites have even produced maps so that viewers can “track the storm”. Worse than all, it isn’t just the ‘storm’ that will bring down Britain. Any peak of any weather type seems to grind Britain and her economy to an unflattering halt. As some commentators observed, the motion of cancelling rail services before the storm had even arrived, had similarities to caving in before the worst arrived; others suggested it wasn’t typical of the British to simply give in, in the face of ‘adverse’ weather conditions. But that is what happened. By 5pm Sunday evening, the majority of train services in the South (before 9am) had already been cancelled, leaving rush hour commuters in chaos and stranded at home. Fallen trees, flooded lines and dangerously high winds had been predicted and predicted correct they were. An empty passenger train was hit by a falling tree, whilst power cables on lines in and out London’s busiest stations have been brought down, leaving many commuters, those as far as the North West and beyond receiving the effects of the weather that the South had suffered with overnight. It is a similar story when every type of poor weather conditions hit Britain. The rail network instantly crumbles, costing the industry millions of pounds worth of delays and cancellations, thousands of pounds worth of customer refunds and exchanges, and unimaginable amounts to Britain’s economy. As is with the anticipation and subsequent arrival of any weather news, journalists and reporters are sent out into the depths of Britain to gain a true understanding as to how people are coping in the face of abject misery. Although many are suffering, with thousands of homes without power and schools closed, what humour can be gained is served from digital news channels. There is something eerily strange about an empty Victoria Station at the height of the Monday rush hour; for those who arrived only to find their trains cancelled, comments such as “I’m considering getting a taxi” may beg the question as to whether it is actually news. A cameraman being blown over on a beach by the force of the winds is more you’ve been framed than Sky News, whilst the drenched appearance of a journalist amongst the weather questions the safety of BBC reporters. Some of the topics discussed during the out of ordinary weather conditions seem to be rather nonsensical. BBC Local Radio have been requesting people to email, tweet them or phone them if they have lost power in their home. Some reporters have turned consumer advisor, telling people how to cope in the weather ahead of the apparent end of the world. 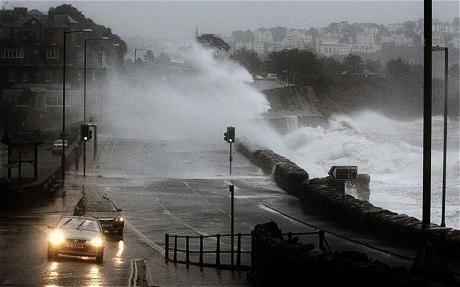 Coastguards have warned of the dangers of being near the coasts and so nearly every journalist covering the natural event has headed to the coast. Every breath taken by somebody covering the story seems to be point blank obvious to the extent where it becomes funny. For hour upon hour, TV news channels tell the same story. Amongst the warnings issued, even with Downing Street advice, include not to travel. It is always a bizarre statement. How are we not to travel? In the face of such acts from above, Britain cannot just grind to a halt and wait for the rain to pass by. It is completely and utterly unviable. Over one hundred flights cancelled at Heathrow is perhaps understandable, as is the cancellation of cross-channel ferry is such rough conditions. How can motorists travelling the United Kingdom simply give in? If everybody did take advice on driving slower and taking more time for journeys then we would be in a pleasant environment. Arrogant drivers who appear in a completely different environment to everybody else are those who cause danger and death. There are still ways of keeping Britain going in the face of wind and rain. It isn’t just the #UKStorm2013 that has got TV news gripped. The snow troubles advise thousands to simply sit tight and wait. The same footage of sliding cars, closed schools, snowy fields and disrupted airports are unimaginatively churned out every time. At the other end of the calendar lies unexpected warm weather which causes disruption, oddly. Buckled railway lines, melting roads and warnings of stay indoors and drink lots of water feels very much like a political nanny state recycled again through news bulletins. 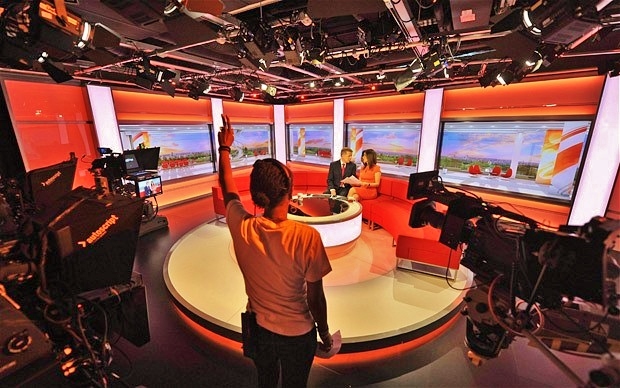 Whatever the weather, 24 hour news channels will cover events. It isn’t news, we all know. Yet there is some kind of trepidation and enigma of seeing somewhere feeling the force of the weather compared to your own comforts which are unaffected. The fascination with our weather is unexplainable. 24 hour news feeds our habit and keeps us at home away from working and doing what we must do. Double page spreads of huge waves ‘battering’ the coast will surface in tomorrows newspapers, to further serialize the drama. The ‘storm’ may be in its full power, but Britain remains on this side of the Atlantic, so it’s not the worst…yet. Ed Miliband listens to the people of Warrington. Labour leader Ed Miliband began his shift from leader of opposition to his dreams of future Prime Minister with a visit to Warrington on Friday with promises to the town’s people. Soon after what had been acclaimed an “impressive” party conference, in which Labour reaffirmed its supporting policies for the most vulnerable in society, the leader toured the North West promoting the party promise of freezing gas and electricity prices as energy firms continue to increase tariffs despite reporting huge profits. Miliband’s visit to Warrington was certainly made high profile by his arrival; a media scrum dashed any hopes of a quiet entrance yet the party leader certainly ensured the voters were at the heart of his campaign. The little over an hour Mr Miliband was in the town’s Stockton Heath Morrisons store certainly made convincing reading for any political analyst. Concerned, sympathetic and humorous are some of the traits I identified in my first meeting with the politician. Noting the importance of Warrington in party politics, in-particular the Warrington South seat, Miliband began with pledges to abolish the controversial bedroom tax if his party is elected at the 2015 general election. Describing it as a “hateful tax”, so called ‘hedge cuts’ will be removed to fund for the abolition. The concern I see at present is that the abolishing of the tax seems like Labour’s one shot wonder; it takes pride of place in their manifesto and the leader’s emphasis on the decision makes it seem like there is little else to offer the ordinary voter. The abolishing of a divisive tax will impress many of those in Warrington who are ‘feeling the pinch’ as the cost of living keeps on rising, but there was little confirmation on how the party aims to crack down on those who actively cheat the benefit and taxation system. From one controversy to another, I tackled Ed Miliband on the HS2 project which will introduce high speed rail between London, Manchester and Leeds. I questioned what many believe is a waste of government spending, worth the best part of £50bn, and whether more of that fund should be spent on existing overcrowded networks and improving the quality of services. Mr Miliband told me he “was in support of introducing high speed rail to this country” yet added “more investment” was needed for the current infrastructure, paving the way for more trains in and around Warrington, as well as more projects including electrification of more lines across the region. For Warrington, the building of the Omega business site has begun and promises to be a leading European hub. Yet it seems incredibly bewildering that the UK’s proposed high speed network will not serve the town. A “review” of HS2 has been promised by the Labour party which could see benefits to the growth of our local economy or the scrapping of the highly controversial project. Economic growth is on all party manifestos and certainly both the Conservatives and Labour have helped many of Warrington’s unemployed get into or back into work. The Warrington South seat is a marginal and vital swing seat for the outcome of an election. I have been told by Labour Party sources that parliamentary candidate Nick Bent “will” win the seat. Mr Miliband’s visit to the town certainly won’t be the last and it certainly won’t be the end of high profile government figures visiting the town. But what about his pledges to the issues that have concerned Warrington residents? High on the agenda of those who were at the meeting was social care. Many acknowledged that under the current coalition and previous Labour governments there had been not enough support and recognition for social workers who are on the frontline of protecting vulnerable residents of the town. Mr Miliband pledged that his party would “raise the status of the profession” and that there would be confident “defending” of the role of social workers. However, with even the Department of Health admitting it cannot afford a 1% pay rise for NHS staff in England, the future for all departments and local governments in raising the profile of such frontline work seems bleak. Keeping children safe is key for any government and in his promises the leader said more must be done to allow parents to work and look after their children. The current 15 hours of free childcare will increase to 25, making it “better for parents” said Miliband. He questioned how any parent can look after children and work. Explaining that the levy on banks will increase, the party leader ensured that those who can afford to pay higher levy’s will. For those children already in education, Ed Miliband was confronted by a large group of young people from a mixture of Warrington’s Further Education and Sixth Form colleges. When told how students feel “stressed” at the thought of ‘end of year exams’, the leader turned to the crowd in a simple yet important show of hands. 100% of those at the event agreed that modular exams and coursework will benefit students and the leader certainly agreed, confirming he “would look to change” the decision made by Education Secretary Michael Gove whom Mr Miliband had described as a man believing “education is for a few people not everybody”. Miliband also added that politics needed to be added to the curriculum in a bid to engage more young people with local government how decisions made in Westminster affect everybody. On the topic of employment, the ‘zero hour’ contracts in some work places were described as “wrong” by the Labour leader, before launching a rather child-like impression to declare that hosts Morrisons were “good employers”. Certainly true yet it felt rather cheesy and desperate from a man faring well in opinion polls. More would be done to ensure regular hours meant a regular contract for thousands of employees. 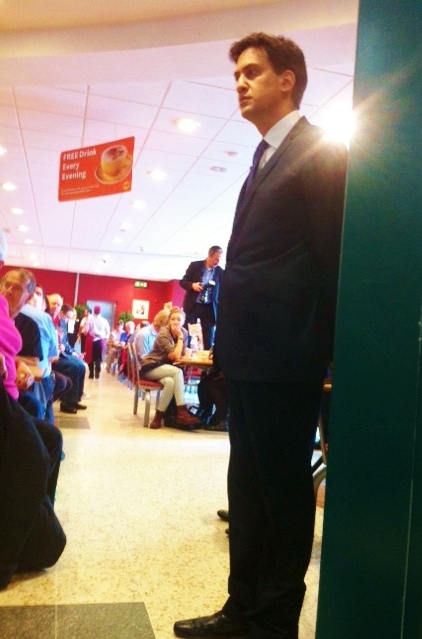 When questioned as to how he would improve the so called “demoralising” experience of job centres, Ed Miliband began by suggesting that the Conservatives lead people to believe that those on the “dole” and in job centres are “scroungers”; he confirmed that under a Labour government, these people would have “support not criticism” when looking for jobs. A comment that was welcomed by the Labour grown crowd. Many of the policies that Mr Miliband talks about are in touch with Warrington. The vast majority of those students and adults alike who attended gave rapturous applause to promises of raising the stigma of mental health and ensuring each individual family are given tax breaks. For me, as an aspiring journalist, his character was certainly warm and genuine; that was the feeling amongst many I spoke to after the event. Back in 2010 when he was first elected, much of the media was critical toward his stance and appeal, yet from beneath the shadows has grown a man who looks, acts and feels like a Prime Minister in waiting. Certainly the visit of the Labour leader was exciting for an ordinary Friday morning. Recent weeks have seen Ed Miliband roll from beneath the carpet and into the front of political debate. The Labour party conference was a success by any means and the row between the leader and The Daily Mail took any hope of interest the Prime Minister had wished for away from his party meeting. The way in which Miliband has attacked the media has shown the growth from a timid character to a powerful opposition to David Cameron. His visit to Warrington was engaging and full of promises. Although, he was one of the first to pledge his support to the Warrington Wolves in their final over the weekend, Mr Miliband will be hoping his dreams of success do not go in the same sour direction.